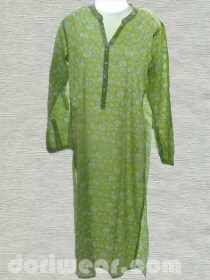 Cotton lime Green color with floral pattern ladies long kurti of UTSA brand by WestSide. This lime Green color cotton long kurti is a perfect ethenic wear with floral pattern design. This ladies kurti from UTSA brand of kurtis, an established brand name in the ladies kurti garments. The long cotton kurti is a prefect ethnic wear that can go over a sit jeans or even leggings. High quality cotton fabric is used to stitch this ladies long kurta. The white floral pattern add more to its ethenic looks and a prefect wear for all ages of girls, working women or house wife. "This Kurti is procured from liquidation stocks of WEST SIDE, Price Tags are removed by WESTSIDE as their Liquidation Policy. Brand tags can either but cut or stroked by black marker by WEST SIDE on all the liquidation garments."